Located on the North Shore of Lake Erie, Port Colborne has a rich history of junior hockey, with teams dating back to the 1940's in the form of the Recreationists, Sailors, and more recently the Pirates. Much of the city's hockey history is tied to the charming relic of a building located on the west side of town known as Humberstone Arena . 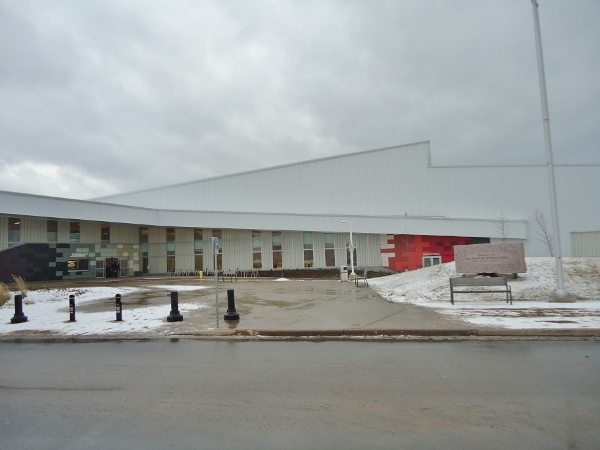 In 2013 the city saw the opening of the modern Vale Health & Wellness Centre, and the Pirates played here briefly before a dispute over the lease and concessions saw them moving a few miles away to Pelham. Enter the GMHL in 2014 and the Niagara Whalers were born, and have filled the void left by the GOJHL quite nicely. The Vale Centre features a modern look and is situated in a park setting with athletic fields adjacent. The facility houses 2 ice pads, a large pool, basketball court, meeting rooms and also serves as the local YMCA. The exterior looks rather antiseptic, and stark, although there is a touch of color with red and orange colored squares adorning a small area of the siding near the main entrance as well as the modern looking signage near the curb. A decent sized parking lot sits in front of the arena, and aside from the small splashes of color, the rest of the arena is a new-looking white, which seemed to blend in with the January gray sky on our visit. A Subway restaurant location sits at the building's main entrance and has signage on the outside of the building. Sunday night is hockey night in Port Colborne, and the Vale Centre is certainly an upgrade from Humberstone Arena, although it certainly may never gain the charm and sense of history of the tiny old barn across town had. Although rather plain from an appearance standpoint, there are various roof angles built into the facility's design, and the structure has a rather appealing look to it. Make no mistake about this though, although the main arena has a capacity of 1000 with room for quite a few more standees this is more of a community arena than it is a big-time event venue. That's OK though as small towns like Port Colborne are what makes up the sense of junior hockey tradition across Canada. Once inside the entry doors of the Vale Centre you will find a ticket kiosk and Whalers merchandise table set up in the lobby on game night. Six bucks will get you a general admission ticket here, which is actually a wristband, and that is certainly a bargain. The lobby features some seating, the Subway counter, and some benches overlooking the pool. Entry to the arena itself for the game is via either a door to the lower level seating which is on one side of the ice, or up a stairway in the lobby to the upper level which opens up to the track which runs around the rink. A grandstand is perched above the locker room and bench area and features 7 rows of gray plastic seats. The walls in the lobby and in the arena itself are white cinder block walls. Being only a couple years old, everything in the venue still has that "brand new" look to it. Floors are polished concrete, and the walls, ceiling, and support beams are all a stark white in color, making for a rather sterile look. Above the upper grandstand is a standing room area with a shelf to hold beverages. The small seating area on the other side of the ice is made of of 3 rows at ice level, and that seating is underneath the press box as well. Quite a few folks choose to stand on the track and view the game, although standing near the pressbox leads to an obstructed view of the ice. Nonetheless there are lots of places to watch the game here, with more than enough seats and decent views depending on where you watch from. With the elevated main grandstand being about 12 feet above ice level the near boards are a bit hard to see, as is common at other arenas of this design. The walls along the inside of the track are made of plastic paneling often used for rink boards, and the fans seemed to take great pleasure in banging on these panel and making noise when the Whalers made a good play. There is a center ice scoreclock, and, although the boards are completely bare of ads, there is some signage for area businesses present in the arena, including a large Pinty's banner present on the wall across from the main grandstand. One odd aspect of the layout of the arena is that in order to move from the seating on one side of the ice to the other you need to leave the arena itself, go up or down the stairway in the lobby, and re-enter on the side you want to watch from, thus the wristbands for tickets. 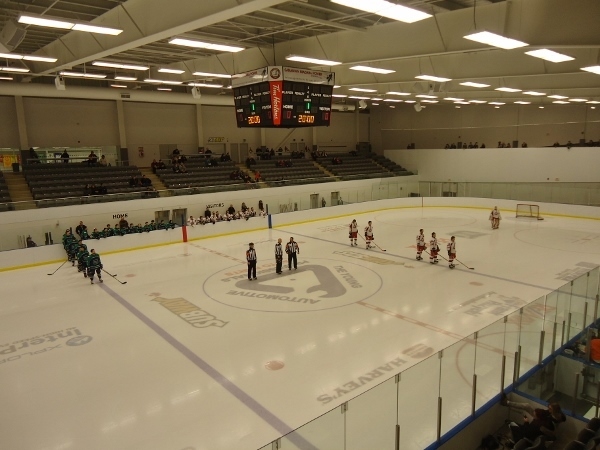 The Vale Centre is certainly a nicely appointed and modern venue, and serves as a utilitarian mix between community rink and arena able to support a decent sized crowd. The gameday presentation at the Vale Centre for a Niagara Whalers game is solid. We did not know what to expect with this being our first GMHL game, and the league getting a bit of a bad wrap since it is an "outlaw league" and not affiliated with Hockey Canada. What we saw was a competitive level of play, and a decent presentation. The game is the main attraction here and the fans are knowledgeable. A small crowd of a couple hundred or so decided to end their New Years Weekend with a Sunday night hockey game. The team has a few promotions and a chuck a puck contest as well as a fan shootout at intermission. The game action was fierce, and featured something we don't see enough of in hockey anymore, a fight that completely changed the outcome of the game. With the Whalers trailing 3-1 to the Toronto Attack there was a bloody toe-to-toe scrap which charged up the Whalers and the crowd, and saw the Whalers score the next 3 goals to take an exciting win. The atmosphere here is very laid back, and there is not any sense of history to the arena at all yet, with it being so new, and feeling rather stark and cold with its nearly all white interior. Nonetheless there are efforts to celebrate Port Colborne's hockey history here, with a rather elaborate series of murals in the lobby, which can be viewed in the lobby as you climb the steps to the upper seating, and features large portraits of Port Colborne locals who went on to play in the NHL. In a rather intricate design the murals are made of of pixelated letters spelling out "Port Colborne" repeatedly in the overall images of the past NHLers. It is a nice touch than could go unnoticed if you don't take a close look around the building. The Whalers game provided for quality entertainment at a great price of only 6 dollars. About the only drawbacks was the rather lackluster PA announcements of goals, penalties and assists and a young girl who appeared to be volunteering for the task just didn't come across as very professional. The announcements were rather hard to hear as a result. Also, oddly, the only food concessions available in the building are from the Subway in the lobby. Don't come to a Whalers game expecting to grab a hot dog, or some popcorn as you will be out of luck. We are certainly glad a league like the GMHL exists as it gives smaller towns a chance to watch some exciting hockey where they may otherwise have no other option for live junior hockey. We were impressed with the level of play as it far exceeded our expectations based on the reputation the league seems to be improperly branded with. Over time we are sure that the Vale Centre will develop its own sense of history and charm, but for now it is a more than adequate place for fans in Port Colborne to catch some quality hockey are a great price.